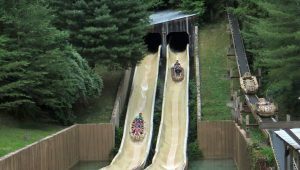 March 18, 2019 – Although nothing has been done to the ride itself, Dollywood’s Mountain Slidewinder has closed after 32 years of operation to make room for an unknown new attraction. 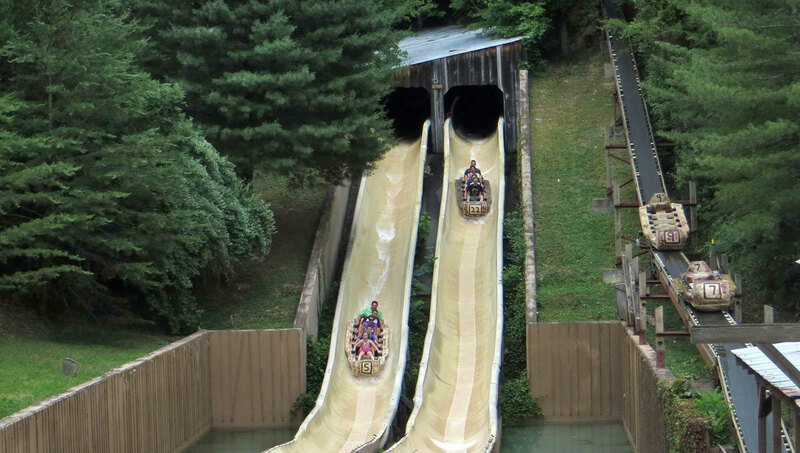 Considered by many to be the best water attraction in the park, Mountain Slidewinder was a water toboggan ride that sent guests on an action packed journey through the woods culminating in a 60 foot (18m) drop out of a tunnel. After making the trek up the mountain side to get to the start of the slide, up to five people would board the sled-like raft before twisting and turning their way back down at thrilling speeds. With sudden bank turns going to the left and right that would send the raft up the side of the slide, you would pick up speed the entire way down causing more and more water to splash all over you! Speculation about the ride’s closure began last November when the attraction’s page disappeared from the park’s website and while we’re sad to see this classic ride go, we can’t wait to see what the park will replace it with. See what our members are saying about the ride’s closure and their speculations on what will replace it in our Forum discussion. This entry was posted in News and tagged closure, Dollywood, Mountain Slidewinder, Pigeon Forge, Tennessee. Bookmark the permalink.